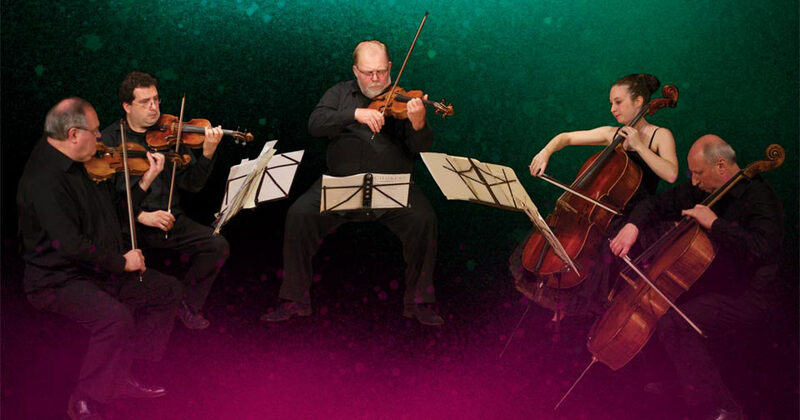 "Strings Attached," the first in a series of three concerts presented by InterHarmony International Music Festival, will be performed at Weill Recital Hall on November 22 at 8pm. 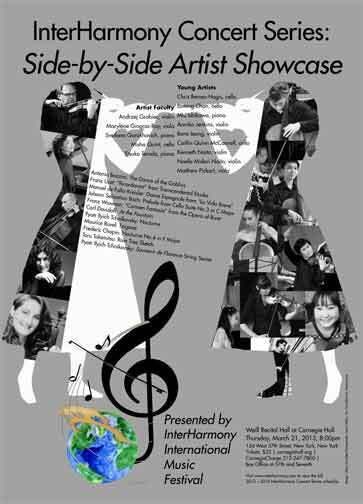 The two concerts following "Strings Attached" will take place on January 24 and April 25 at 8pm. Celebrating three iterations of the string ensemble, "Strings Attached" features a unique transcription of Dvorak's "Terzetto in C Major, Op 74," in which a cello replaces the part of the work assigned to a viola. The three-part performance continues with a rendition of Kodaly 's "Duo for Violin and Cello, Op. 7" and Schubert's "String Quintet in C Major." 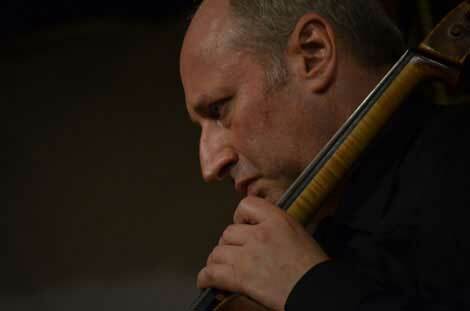 Cellist Misha Quint, InterHarmony's Music Director and Founder, will perform in all three acts. Dvorak's "Terzetto" was originally written in 1887 for two violins and a viola, in an effort to accommodate the talent of a chemistry student, an amateur violinist who was staying at the composer's home. The addition of the cello, and the replacement of second violin, gives "Terzetto" a deeper sound, transforming the piece from "a truffle" to a work of greater resonance. Cellist Misha Quint, violinist Andrzej Grabiec, and violist Yuri Gandelsman will perform this first piece. Described as a symphony for two instruments, Kodaly's "Duo for Violin and Cello" embodies the composer's assimilation of European folk material into the art music for which he and Bartok were so renowned. "Duo," which was composed in 1914 and premiered a decade later, is an exhilarating showpiece that demands impeccable virtuosity from its performers. The melody and echoing response between violin and cello constantly interweave to form an exciting musical give-and-take. Kodaly's "Duo" continues with an alternating tempo that defines the music's rhapsodic tone and texture, with the violin and cello taking on a swaying exchange that beckons to its folkloric roots. Andrzej Grabiec and Misha Quint will perform "Duo". Violist YURI GANDELSMAN has been performing internationally as a soloist, chamber musician, and conductor for over thirty years. Born in Tashkent in 1951, Gandelsman studied in Moscow with Heinrich Talalyan of the Komitas Quartet, and Valentin Berlinsky, cellist of the Borodin Quartet. As a student in 1974, he assumed a position with the Moscow Philharmonic Orchestra under Kiril Kondrashin, and proceeded to win the National Viola Competition in 1980. Gandelsman went on to join the Moscow Virtuosi Chamber Orchestra as a principal violist and soloist, and quickly became one of the leading musicians in the former Soviet Union. He has performed with Sviatoslav Richter, Evgeny Kissin, Oleg Kagan, Natalia Gutman, Yuri Bashmet, the Borodin Quartet, and the Shostakovich Quartet. Gandelsman was the principal violist of the Israeli Philharmonic under Zubin Mehta, and has performed solo recitals throughout the world. He was a member of the Fine Arts Quartet, as well as a former professor at The Samuel Rubin Israeli Academy of Music in Tel Aviv University, now the Buchmann-Mehta School of Music, and is currently a professor at Michigan State University College of Music. Violinist MIROSLAV HRISTOV has been hailed by Fanfare Magazine for his "fine technique and a full palette of tonal colors." In 2012, he was a featured soloist in the Carnegie Hall presentation, "Music from the Balkans: Crossroads of Civilization", where he performed for dignitaries of over a dozen European nations. He has presented master classes and performed as a soloist, chamber musician, and orchestra leader throughout the United States, Mexico, Puerto Rico, France, Portugal, Spain, Germany, Poland, Croatia, Greece, Norway, Sweden, as well as his native Bulgaria. Previously, he taught violin in the Universidad Autonoma de Nuevo Leon in Monterrey, Mexico where he served as Principal Second Violin of the Orquesta de Camara de Monterrey and the Orquesta Sinfonica de la Universidad de Nuevo Leon. In 1995, he was First Prize winner of the National Violin Competition "Dobrin Petkov" in Bulgaria, and was later invited as a soloist to perform with the Plovdiv Philharmonic. In 1998, he was a prizewinner for the MTNA Collegiate String Performance Competition. As a former winner of MTNA, he also serves on the juries of several string competitions. For eleven seasons, he served as both Associate Concertmaster and Acting Concertmaster with the Knoxville Symphony, performing numerous chamber and solo recitals as first violinist in the Knoxville Symphony Orchestra Principal Quartet. As a soloist and chamber musician, he has recorded for Centaur Records, Bulgarian National Radio and WUOT in Knoxville. Cellist CAITLIN QUINN McCONNELL, winner of Gladys W. Fisher Violoncello Award, the PFMC Award, the Harvey Gaul Award recognizing artistic potential, Agnes Fowler/Marie V. Thiesen Award and the Lawrence Foster Violoncello Award among others, has performed extensively in the United States, and Europe. 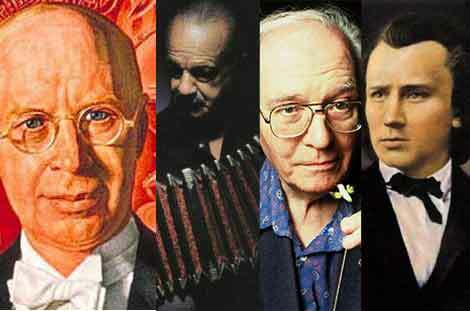 McConnell was part of different festivals including Soesterberg International Music Festival in Holland, the Sulzbach-Rosenberg International Music Festival in Germany, the Festival of the Musical Citadel in Brasov, Romania, and the InterHarmony International Music Festival in The Berkshires in Massachusetts; San Francisco, California; Hinterzarten, Germany; and Italy. McConnell was featured on Oberpfaltz TV in Bavaria, Germany and television in Brasov, Romania. She performed in the Isaac Stern Auditorium at Carnegie Hall as part of the New York Women's Ensemble in November of 2011, and performed Tchaikovsky's "Souvenir de Florence" at the Weill Recital Hall at Carnegie Hall in New York in March of 2013. McConnell graduated with a Masters from Duquesne University under the tutelage of Misha Quint. McConnell is also a scholar, and her work has been published in the International Jazz Archives Journal, distributed to 20 countries. Join us for a concert showcasing our world-renowned artist faculty and talented young artists who have been part of InterHarmony International Music Festival in Europe. Program TBA.